Vantage Cost is committed to not only providing the best cost reduction on your indirect spend, but also providing you with the resources you want on a weekly and monthly basis. 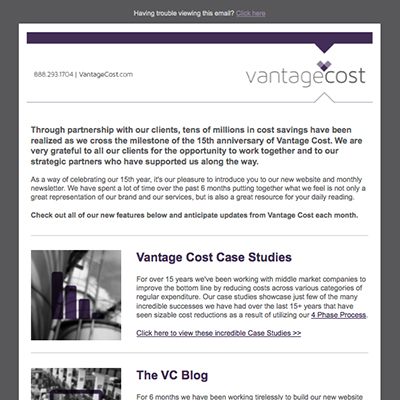 By signing up for our monthly newsletter, you will receive breaking Vantage Cost news, highlighted posts From Our Vantage Point and you’ll also be the first to know about any new offerings or cost-saving opportunities we’ll be making available. Sign up for our monthly newsletter by filling out the form to the right.